A pair of programs who have enjoyed substantial success in recent years will meet in the Class 6A quarterfinals. The Olathe North Eagles rebounded from a 1-3 start and enter their matchup with the Blue Valley Tigers on a six-game winning streak. 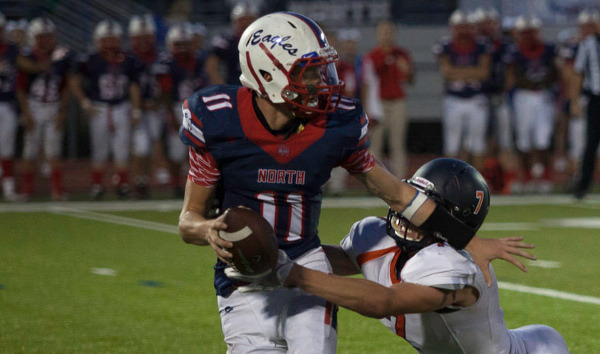 Last week, Olathe North ousted Sunflower League foe Lawrence with a 35-14 victory. The Eagles rushed for 477 yards in beating the Lions for the second time this season. Daymonn Sanchez leads the Eagles’ rushing attack with 940 yards on 116 carries. Sanchez went off for 313 yards and three touchdowns in the win over Lawrence. Freshman Arland Bruce has rushed for 724 yards on 125 attempts after 150 on the ground last week. Blue Valley’s three losses are to Bishop Miege, St. James Academy, and St. Thomas Aquinas – three teams that remain alive in their respective qualifications. The Tigers have won their past two games, beating Shawnee Mission West 42-8 and Olathe South 38-21. In the win over Olathe South, Luke Bernard passed for 120 yards and one touchdown, while Walker Kinney threw for 90 yards and two touchdowns. On the season, Bernard has passed for 1,388 yards, while Kinney has thrown for 989. Benjamin Dezube has been the team’s big-play receiver with 33 catches for 660 yards and three touchdowns. Junior Alex Totta leads the Tiger ground game with 530 rushing yards and six scores. This marks the third straight year Derby and Free State meet up in the playoffs. Derby has won both meetings with a 35-14 victory in ’15 and 49-21 last year. This season, Derby has delivered a 454-216 total scoring margin against the No. 4 strength of schedule in the classification, according to Prep Power Index. Derby is third in offense, while Free State is tied for second with Garden City in total defense. Free State, the lone undefeated in 6A, has been No. 1 in the classification most of the year. The Firebirds have a total margin of 426-123 against the second-easiest SOS. Derby has captured four state titles, including the last two and three of the last four. Free State has consistently played deep into the postseason with semifinals, quarterfinals, semis, semis, and semis the last five years. Free State has one state title appearance, a runner-up in ’08. The Panthers have significantly improved on defense throughout the year, including a 21-14 road win against Manhattan last week. Derby bounced back from some early adversity. On the game’s first drive, the Indians stopped Derby standout back Brody Kooser twice from the two-yard line to force a turnover on downs. Then, Manhattan had 10 plays for 95 yards and a 7-0 lead. Hunter Igo completed 10 of 15 passes for 147 yards for the Panthers. He helped Derby tie the game at seven on a TD pass to Tyler Brown before Manhattan took a 14-7 lead with 4:28 left in the second quarter. In the third quarter, Igo found Brown again for the game-tying score, and then Kooser provided the final points with a touchdown. Later, Derby forced a Manhattan turnover on downs after the Indians had moved to the Panther 13-yard line. Igo had 15 carries for 117 yards against Manhattan’s defense that ranks No. 1 in Class 6A. Free State has enjoyed a standout year from junior running back Jax Dineen and has been great on special teams in the first two playoff games. Last week, the Firebirds defeated Junction City, 47-14. Gabe del Valle had an 82-yard punt return TD, the first special teams score this year. Senior punter/kicker Jake Rittman helped pin Junction City back numerous times. Senior quarterback Gage Foster has led the offense. One of the state’s most anticipated games, Free State likely needs another big game in special teams. Derby’s offense continues to operate at an elite level, and the Panthers have significantly improved on defense throughout the year. Last week, the Panthers earned a road win versus the No. 1 scoring defense. They do so against another elite defense this week.